Panelists discussing strategic directions for Asian G-WADI. Photo Credit: NGRI. The Asian regional network of UNESCO’s drylands water resources program, G-WADI, for which ICIWaRM is the Global Technical Secretariat, held its 7th meeting and workshop at the National Geophysical Research Institute (NGRI), Hyderabad, India from Nov. 26-30, 2017. The major scientific topic of discussion at the workshop was an increased inclusion into G-WADI of research on semi-arid region groundwater systems. Use of airborne geophysical investigations to obtain a 3-D continuous picture of the subsurface, as well as the potential impacts of climate change, such as highly variable rainfall, increase in temperature, sea level rise etc., on groundwater fluxes were discussed. 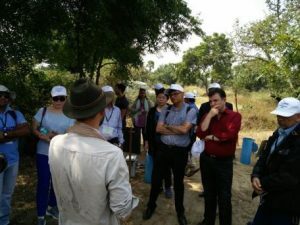 To complement these discussions, a field trip was also taken to a micro-watershed being monitored and studied by the NGRI known as Experimental Hydrological Park (EHP). The experimental set-up at EHP included recharge experiments, and a live demonstration of a few geophysical investigations was also given. Overall, improved knowledge and techniques to reduce the uncertainty of the estimates of the surface water- groundwater fluxes may be needed to attain the UN-Sustainable Development Goals (SDGs) related to water resources. Workshop participants visit experimental watershed. Photo Credit: NGRI. At the strategic meeting for Asian G-WADI, it was agreed to transfer the Asian G-WADI Secretariat from China to India, consistent with the policy of rotation among the participating countries. NGRI’s proposal to host the secretariat for the period 2018-2020, with Dr. Shakeel Ahmed as the Secretary, was unanimously accepted by the participating countries. 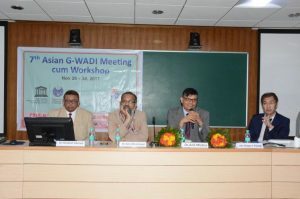 The move marks a return of the Asian G-WADI Secretariat to India; in March 2005 its first Secretariat was established at National Institute of Hydrology, Roorkee. Asian G-WADI members present also decided to review the relevance and improve the networking of existing G-WADI basins, link with Global G-WADI and other regional networks on similar research topics, enhance the visibility of the Asian G-WADI network, and broaden the use of its information of among a wider audience.